Lisa Raymond: Emily Bazelon interviews her old tennis nemesis, a 39-year-old pro with 83 career titles. 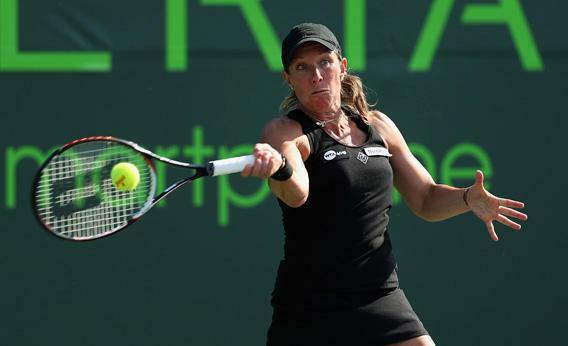 Catching up with 39-year-old pro Lisa Raymond, who destroyed me on the court when I was 12 and she was 9. 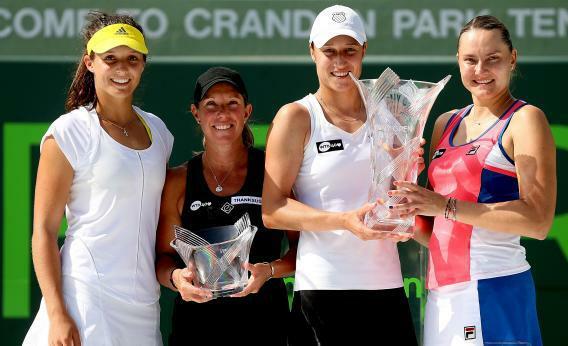 From left, Laura Robson, Lisa Raymond, Katarina Srebotnik, and Nadia Petrova pose for photographs after the Sony Open doubles final at Crandon Park Tennis Center on March 31 in Key Biscayne, Fla.
One hot summer day when I was 12, I stepped onto a clay tennis court to play a girl I’d never met before. I knew that her name was Lisa and that she was 9, and I could see that she was short. I figured that I’d gotten a lucky draw. Here’s what I remember about what came next: shot after topspin shot, deep, well placed. And even more than that, pure, calm determination. Lisa wasn’t flashy, as a player or a person. She was polite to a fault, and even kind—not to be taken for granted in junior tennis—but she was also utterly focused. I’ve never seen athletic determination like that up close, before or since. She was a competitor getting a job done, and I was just a flighty girl, totally outclassed despite my three-year age advantage. I’d like to say I won a single game before my brief excuse to be out on the court with Lisa ended, but I’m not even sure of that. Throughout my unstoried tennis career, I lost to plenty of players, but Lisa was the one I remembered. So it was gratifying, sometime in the mid-1990s, when I caught Lisa Raymond playing on TV. I’ve followed her on and off ever since, with a kind of weird one-sided pride. Not only did I spot a winner 30 years ago, I picked a woman who’s had one of the longest careers in the game. Lisa waited to go pro until she turned 19, after playing for two years at the University of Florida. She won the NCAA singles title twice, and she was the first player ever to win all three Grand Slam college titles in one season. Staying in college meant that she wasn’t out on the tour with other girls who were trying to follow Tracy Austin (and later Jennifer Capriati) into teenage celebrity. After she turned pro, Lisa spent 10 years ranked 31 or higher in singles—her peak was 15, in 1997—and she has won an astonishing 83 WTA titles, including 11 Grand Slams. But if you’ve never heard of her, that’s because 79 of those titles and all 11 of the Grand Slams have come on the doubles court. Lisa played for years with Australian Rennae Stubbs, and then some with another Aussie, Samantha Stosur. But last month, when Stosur got injured, she entered a tournament as a wild card with a new partner, Laura Robson—who at 19 is less than half Lisa’s current age (39). They went on to beat the world’s top-ranked doubles pair, Italians Sara Errani and Roberta Vinci, before losing in the final. After I saw the picture at the top of this page, in which Lisa is a head shorter, not to mention a generation older, than the other three Sony Open finalists, I decided I had to call her. Twenty years into her pro career, how has she outlasted just about every single one of her peers and how has she stayed so damn good? Here’s an edited version of our conversation. EMILY: OK, I want to hear it—what’s the secret to your longevity? LISA: You know, it’s a combination of factors. I’ve been very fortunate with injuries, or the lack thereof. And I’ve only played doubles for the last eight to 10 years. And of course that’s not as hard on the body. The matches are shorter and so are the points. You’re not running down balls for three hours all over the court. It’s almost as if I’ve had a second career since I stopped playing singles. But you know, also, if I’d been pushed harder when I was very young, if I hadn’t gone to college, if when I was younger I’d gone to tennis academies and tennis had been my life 24/7, 365 days of the year, I truly believe there is no way I’d be playing now. Because you just burn out. I’m not saying I wasn’t pushed. I was at a tournament every weekend, and I played on the U.S. National Junior team, and I did well. But in comparison to a lot of the girls then, and all the girls and guys now, the amount of hours I practiced in a week—they’re doing that in two days. I look back, and there were times I wish I had more time with my friends, but my parents were nothing compared to these crazy tennis parents out there. I went to high school, to prom, to senior week, to college. Because of those choices, I had a better perspective, and I truly attribute a lot of my longevity to that—physical and also mental. You know, emotionally, it’s not an easy life out here. When you’re doing well, it’s phenomenal. But when you’re not, it is very tough. EMILY: That’s interesting, because these days there are hardly any teenagers in the top 50 or even 100, for both men and women. They seem to be having trouble breaking through. That’s so different from when you and I were growing up, and Tracy Austin was cleaning up before she could drive. What do you think about that shift? LISA: The game for men and women is just so much more physical than it was 15 or 20 years ago. Girls and guys at 16 to 18 just are not strong enough, not developed. The rackets are so much more powerful, and the new strings, but also everyone’s fitter. Nutrition is a huge part of the game now. It’s a bigger and more powerful sport. It has changed so much. Players have teams with them now. When I was coming up, no one traveled with a trainer, a nutritionist, a physio. You put in your hours on the court, maybe a few in the gym—that was it. Now it’s truly a team effort with the top players, and the physicality of the sport has made a huge difference. There won’t be any more Capriatis and Martina Hingises. You won’t see that anymore. The Williams sisters came along, and Monica Seles, and Mary Pierce, and they really started this powerful type of tennis that took the game to a new level. EMILY: You’re not big or tall. [Lisa is 5-foot-5.] Do you think you wouldn’t be able to have the success you had in singles in the ’90s if you were coming up now? LISA: Good question. I was never someone who would overpower you, and I have a one-handed backhand, with slice. I was versatile, all over the court, moving in, setting up my volleys. EMILY: Right—you know how to play at the net, which a lot of people don’t, even on the tour. EMILY: I want to ask you about how you stay mentally tough. Why do you think you’re such a strong competitor, and why have you been able to keep that up? LISA: I just loved sports growing up. Everything and anything. Basketball, throwing the football with my dad. When my parents saw I had pretty good hand-eye coordination and could hit a tennis ball, they invested in lessons and clinics. They made sacrifices, my whole family did, to travel with me to tournaments. And I always felt like I was good at it, and I loved competing, and I love doing well. That’s why I’m out here: I love winning. People say sometimes it has to be about the process, about the practicing, but for me, it’s not. I had a phase where I told myself, it’s OK if I lose. But I’m a perfectionist. At 39 years old, I go out and practice, I go to the gym. I do it to win tennis matches. A few years ago, I let myself go a little. I was out of shape, having personal issues, and I had a rude awakening on the court. I had to decide to recommit myself to fitness and to the sport. I was a shell of myself at that moment. Now I’m happy again, and I’m playing well—it’s been a good last couple years. EMILY: What do you think about when you’re playing a match, like before a big point? Are you thinking about where your feet are, and your body, and the ball? Or are you in that Zen space athletes describe—which I have to say, I have no idea what that feels like. LISA: I’m not Zen. I’ve never done visualization, like, OK it’s match point, what will I do on this serve? That’s never been my thing. For me, it has to be much more tangible. I’m a person who needs to touch and feel. If I feel good on the practice court, if I’m hitting the ball well, that will translate into playing a good match. EMILY: To me, that’s an amazing and actually inconceivable idea. I am a head case in matches. I really think that if I lived my life the way I compete in tennis matches, I’d be a homeless person. LISA: You don’t play as well in matches as you do in practice? EMILY: I get so nervous I blow the big points. And a lot of other points, too. I get tight, and I can’t really breathe. And this is for matches that don’t really mean anything! How do you not do that? LISA: Oh, I’ve blown plenty of big points. I’ve had matches where I’m in knots. But through the years, you learn to deal with that on the match court. I have a routine before a match: I try to break a sweat beforehand, so I’m really warm when I get out there. When I get nervous, I remind myself to keep moving, and to keep going for it. I play my best tennis when I’m aggressive. Singles or doubles. When I’m going for serves, returns, coming to net. I’ve always told myself when I’m serving a match out, or match point, I have to keep doing what I did to get there, and that means being very aggressive. The more times you’re in that position, the more you can rely on experience. EMILY: Aha. There were record numbers of players older than 30 in last year’s Grand Slams. Is that about experience? LISA: For me it is. I can tell myself: I’ve been in this position hundreds of times. I’ve come out on top. It’s something I’ve done since I was 7 years old. I’m used to it, and I’m comfortable. It’s like just knowing if you do right things you’ll win. EMILY: Huh, right. You know you can come through—what a concept. EMILY: I guess that goes back to how you love competition. LISA: If you’re a pro, if you dread it, you shouldn’t be doing this. You want to be serving. You want the ball. One of my best friends was like that growing up. I remember watching her and she was panic stricken. She could not get it done. EMILY: I sympathize. Lately I’ve been trying to get better at playing doubles. What do you look for in a doubles partner? LISA: You pick a good partner. There has to be chemistry. It sounds stupid, but it’s true. You want to get along with the person. You want to like them. Your games want to mesh well. EMILY: Do you look for tall partners? LISA: That helps. Laura is tall, powerful, young, and she brings unbelievable energy to the practice and the match court, which is a lot of fun for me. Probably the best match for me is someone with bigger shots. Then I can take over at net, they can be at the baseline, setting me up. EMILY: For a long time you played with Rennae Stubbs, and then Samantha Stosur, who are your age. EMILY: What’s it like to have a partner who is so much younger? Do you talk to her a lot on the court? 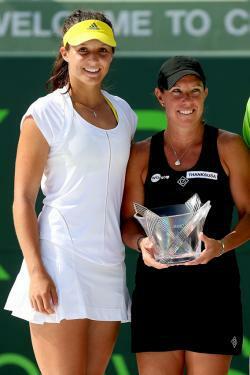 Laura Robson and Lisa Raymond after the Sony Open doubles final in March in Key Biscayne, Fla.
LISA: Laura is a lot more mature than 19. She just has a very good tennis mind, especially for a 19-year-old. Her shot selection is pretty good. She knows where she is, she moves pretty well on the doubles court, she knows where to be. She has a lot of respect for me, for my advice on the court, and she brings a lot as well—a new energy that’s fun and fearless. It’s nice for me to be excited again. EMILY: Does it feel a little bit like you’re mentoring her? LISA: A little bit. We’ll see what happens. She’s teaching me about music, and I’m trying to play some doubles. EMILY: Do you know how long you’ll keep playing? LISA: I don’t know. When I feel like I can’t compete to win the Grand Slams, if I don’t feel I can play at that level, I’ll walk away. But if I can stay healthy, and feel I can do well, then I still have some goals. EMILY: Like what? What’s the record for the most tournament wins for women’s doubles? LISA: Oh, I don’t know. Navratilova had 100 and something, some ridiculous amount. [Martina Navratilova played doubles until she was almost 50, amassing 177 titles and 31 Grand Slams.] The goals I have, I’d love to win another Slam. I won the Open the year before last. I’d like to win another one and get back to No. 1 in the world in doubles. [She’s currently ranked No. 11.] I have 79 titles—I’d love to get one more. 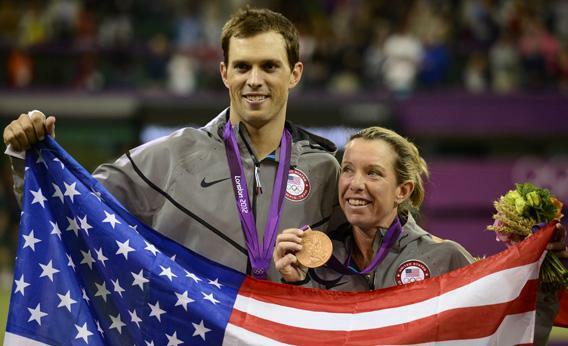 Lisa Raymond and Mike Bryan hold up their bronze medals during a ceremony after the 2012 London Olympics mixed doubles tennis tournament. LISA: We’ll see how it goes with Laura. EMILY: What about when you’re ready to stop playing pro—do you think you’ll go into coaching? Talking to you I think you’d be a good coach. LISA: I don’t think so—there’s too much traveling. I think I’ll attach myself to something at home. I live in Media, outside Philadelphia. EMILY: Wait, isn’t that where you grew up? LISA: Right, it’s very close. My family, everyone, we’re still in the area. Maybe I’ll stay attached to tennis somehow, like at a club or a camp. Or I wouldn’t mind doing something totally different. Maybe I’ll open a bakery.